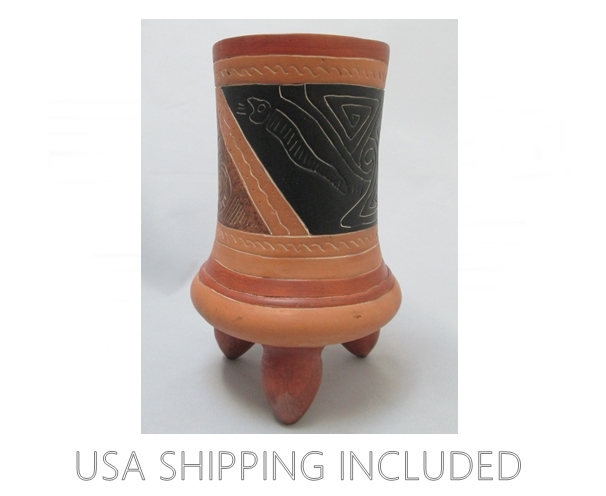 This red clay vase was hand made in Mexico and hand decorated with incised designs outlined in white. The black panel shows two fire-breathing serpents, one heading north and one heading south, surrounding geometric symbols which may be representations of pyramids. The speckled tan panel in photograph #2 shows a stylized version of the feathered serpent so prevalent in Mexican art since Olmec times. The shape is a cylinder that flares at the bottom and sits on 3 fat pointed legs. The interior is fully glazed with glossy dark green. The impressed mark on the bottom reads "MEX 85," conveniently dating it for us. 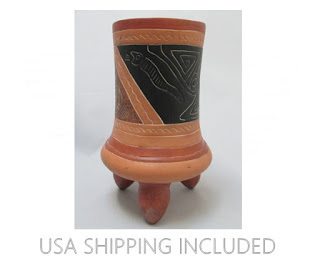 This type of pottery is made around the Teotihuacan area, north of Mexico City.